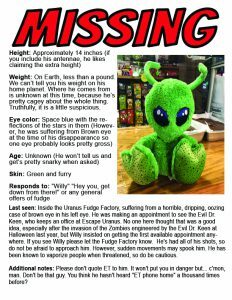 URANUS, MO –– On April 11th, 2019, the Uranus Police Department was officially contacted by the Fudge Factory regarding the disappearance of one of Uranus’ much-loved residents, Willy. Many may know Willy as the little green alien who lives in Uranus. Prior to going missing, he could often be found hanging around the Fudge Factory, and posting regularly to social media. Unfortunately, Willy was stricken with brown-eye, an odd epidemic that’s been plaguing Uranus, and in his desperation, reportedly sought help from the Evil Dr. Keen. He has not been seen since. Willy is a small alien (about a foot tall, weight unknown) with green fur and blue eyes. He responds to his name and any general offerings of fudge. He’s received all of his shots, but does carry a vapor gun so, if seen, should be approached with caution. Anyone who may have information on Willy’s whereabouts or may have seen him is encouraged to notify the Uranus Police Department.